(BPT) – Today’s modern family juggles a multitude of obligations that keep schedules incredibly busy during the summertime. Parents balance work, errands and housework with sports practices, day camps and music lessons. Fortunately, creating quality time for family doesn’t require a lavish vacation or expensive activities. Here are 10 surprisingly simple ideas to help carve out more time for bonding and creating lasting memories with your family. When kids are little, the day often ends with a storybook. When children grow, don’t let their love of reading dwindle. Read a chapter from a longer book each day with your elementary-aged child. For older kids, select a book or series and start a family book club. Discuss your pick weekly over a meal or sweet treat. July is National Ice Cream Month! 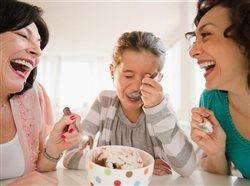 Enjoy the bonding benefits of enjoying a treat together later in the day by sharing a dessert. Indulge in Jack Nicklaus Ice Cream, created by the golf legend and his wife Barbara — themselves parents of five children and grandparents of 22 — in partnership with The Schwan Food Company. Plus, feel good that this delicious treat supports Children’s Miracle Network Hospitals. Scoop up some creamy black cherry or chocolate peanut butter swirl and let the conversation flow. Learn more at jacknicklausicecream.com. Volunteering is a wonderful family activity that can be done once, or on a more regular schedule. Not only will you teach your kids the importance of giving back to the community, but you’ll also instill in them important traits like empathy, understanding and optimism. Looking for an outdoor activity that gets you up and moving? Miniature golf is a great option that is adored by kids and kids-at-heart, plus it’s an affordable way to spend time together. Look up local courses and head out for some friendly competition — beat the heat and go at night! Dig out old family videos and photo albums and go through them with your children. You’ll enjoy taking a trip down memory lane, and your kids will enjoy poking fun at your questionable fashion choices of the past. Taking walks with your family is great exercise and an easy way to catch up on life’s happenings. Make it an evening ritual. Explore your neighborhood or select new parks in the area within a short distance. Celebrations aren’t just for birthdays. Small achievements deserve recognition, too. Did someone have a big hit or make a great play at Little League? Make his or her favorite dinner. Did someone complete a scout project? Picnic at the park. Mom landed a new client at work? Create sundaes with Jack Nicklaus Ice Cream and plenty of toppings. A crazy schedule leaves little time for keeping in touch with relatives. Stay close to grandparents and other loved ones by designating time to call them together. A phone conversation or video chat session can mean the world to family you rarely see. Give your child your undivided attention once a day. Just 10 minutes, perhaps during breakfast or before bed, shows you care. Let them lead the conversation about how the day went and what they did. You’ll learn amazing things about your child when you open your ears. Does your child have a favorite hobby? Get out of your comfort zone and try it together. Whether it’s drawing anime, building robots or tap dancing, let your child teach you about the things he or she loves. Plus, you’ll demonstrate resilience and willingness to learn.